While pausing for a moment on a weekend walkabout, a daredevil butterfly began flying tight circles around me at knee level. Several mad minutes passed as I tried to follow his flight round and round and round. Never could catch the little booger, but settled for his shadow. 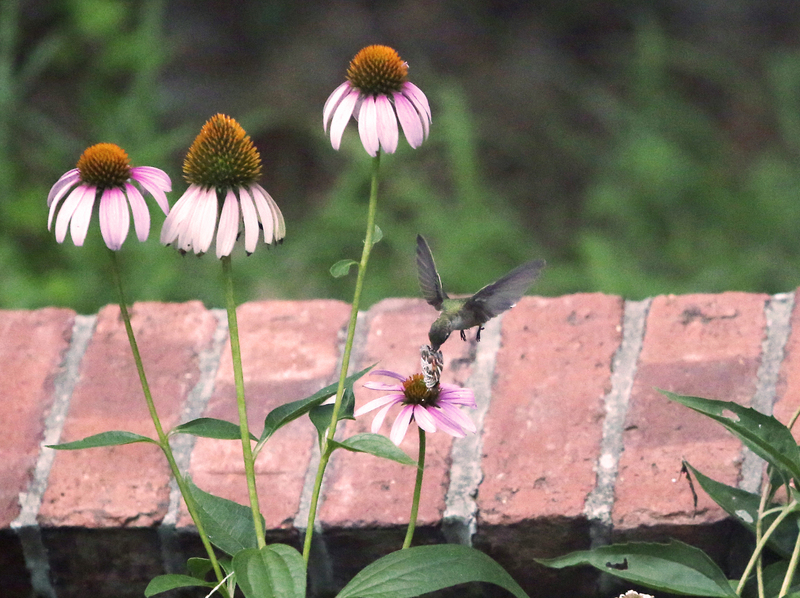 When the competition at the feeder was too rough, some hummingbirds opted to find nectar in the wildflowers below. The competition there was pretty good too — what with all those butterflies, bees and other pollinators. 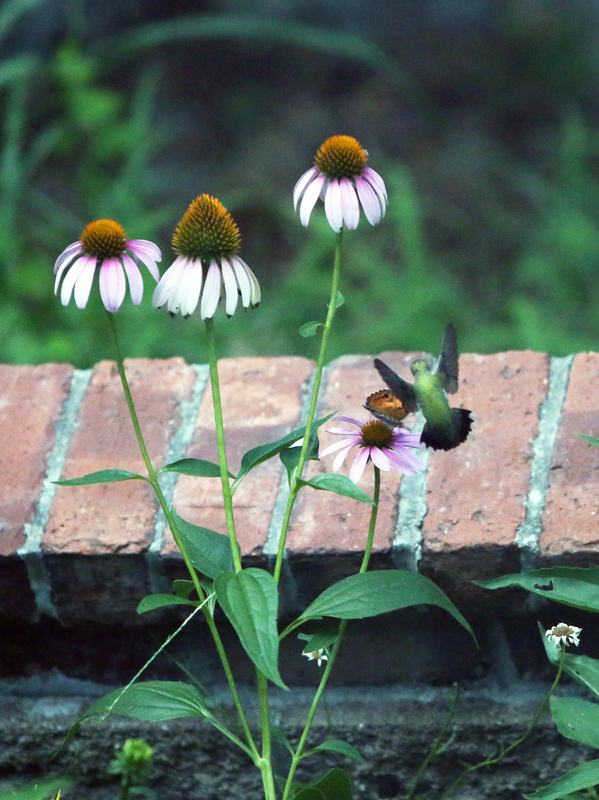 Here, a hummingbird goes for what must be the juiciest flower in the garden, since the butterfly was already there. 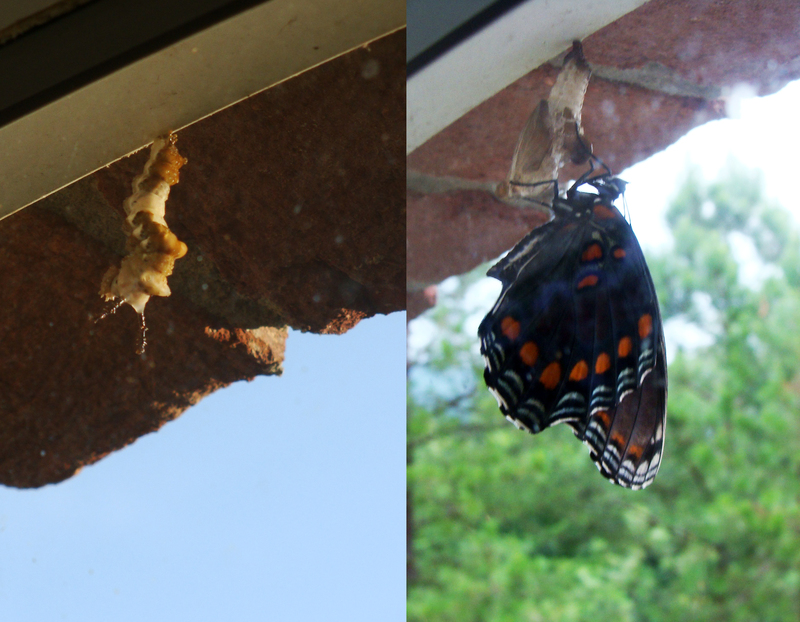 A red-spotted purple emerges from its chrysalis July 22, a week after the photo on the left was taken. What a treat to catch this event just before having to start the morning commute. This red-spotted purple probably escaped a predator at the cost of a wing and the ability to escape again. Though grounded, he continued to spread his wings in the sunshine. 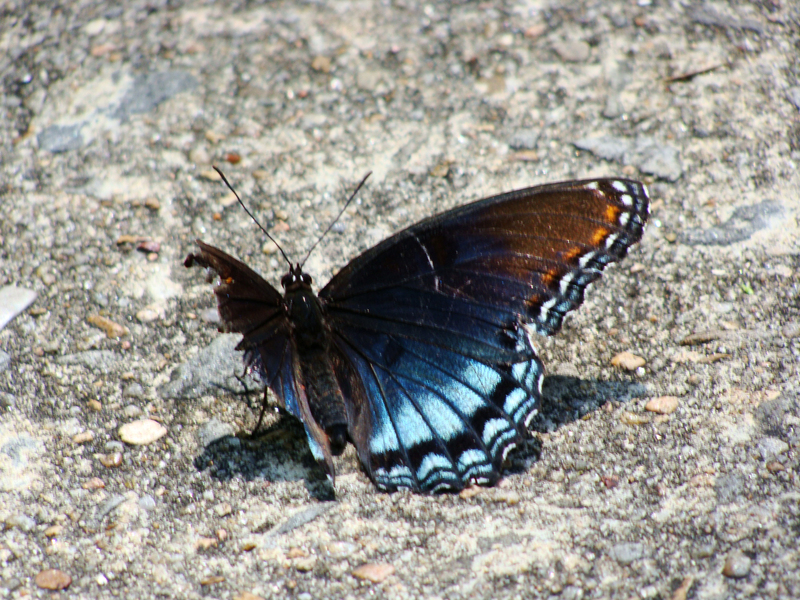 STILL BEAUTIFUL – Red-spotted purple butterfly warms himself on the roadway. 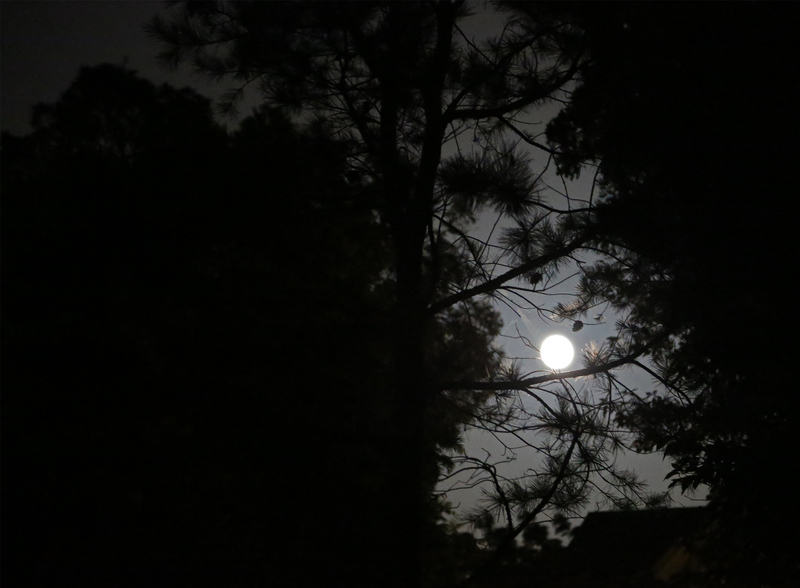 Supermoon framed by pine trees. Taken July 12, 2014. 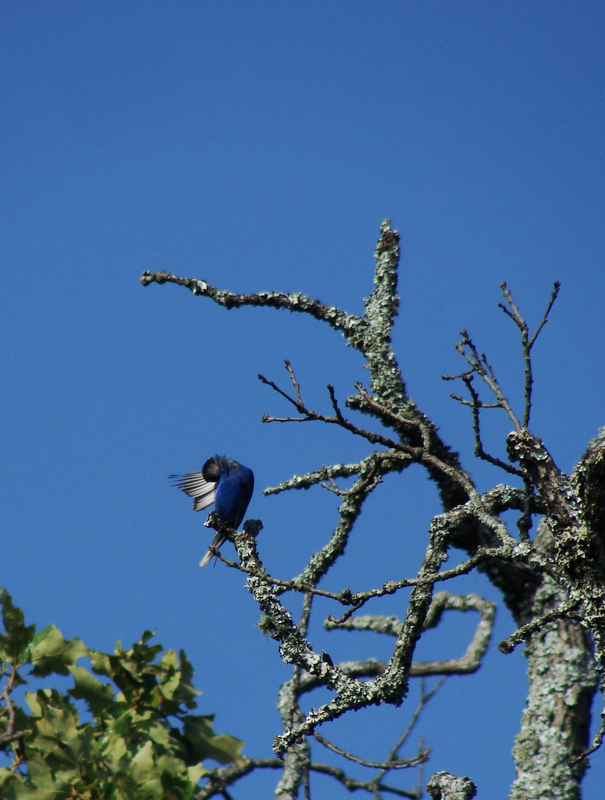 Indigo bunting preening. Taken July 13, 2014. 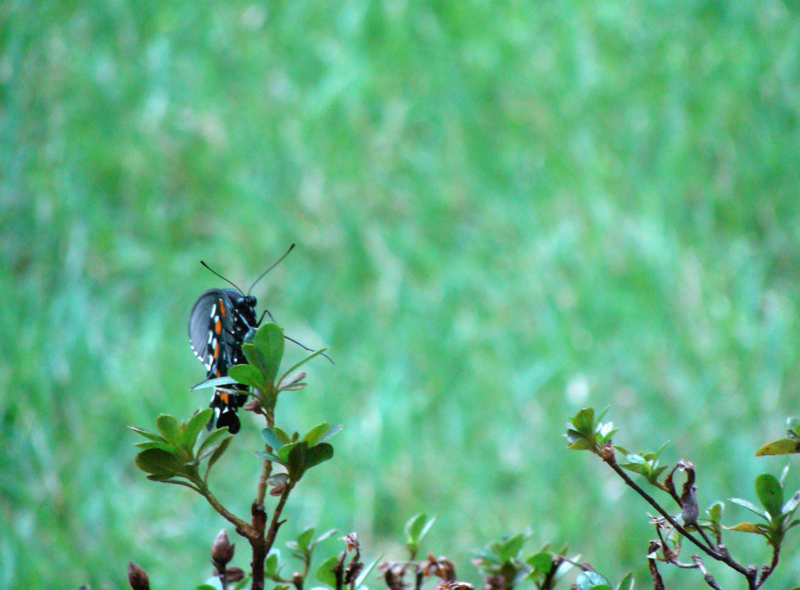 Butterfly hanging on the underside of an azalea branch outside the office window. 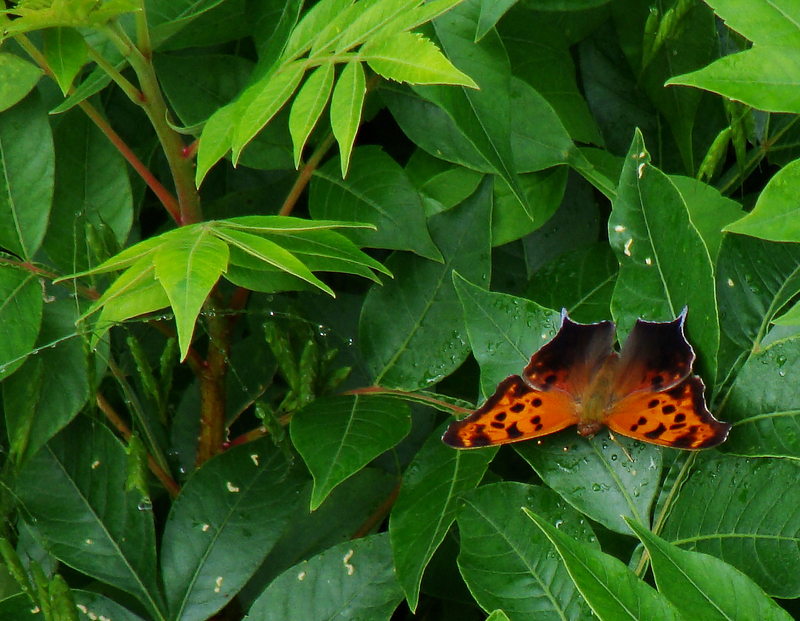 Saw this beauty in the sumac below the deck this morning and wondered what he was. My question was answered by the orange page of University of Florida butterfly guide. He’s called a Question Mark and has a lovely Latin name too: Polygonia interrogationis. And speaking of things orange, there’s a new sunset posted. Well, not really new. One from a snow-covered day in March. The monarchs are back. Well, at least one monarch. This one was trying to rest in the goldenrod this morning, but found himself being buffeted by breezes, honey bees, wasps and other pollinators. You can see the wear on his wings — appearing as scratches in some of his orange areas.